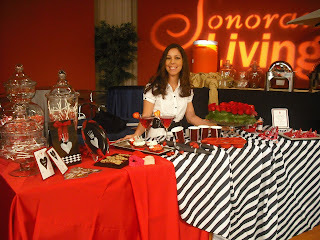 Last week I had another opportunity to be on Sonoran Living shoot with host Stephanie Sandoval. 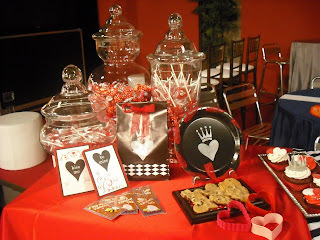 This time she asked us on tips to planning a perfect valentines day party for your girlfriends. If you would like to see the video of the shoot click here. It doesn’t have to be valentines day to throw this party but with the new Alice in Wonderland Movie coming out and V-day right around the corner it seems like a great time to do so. Decide who you will invite :: Is it for adults, children or families? This will help you choose your menu items, drinks and activities of involvement for your guests. 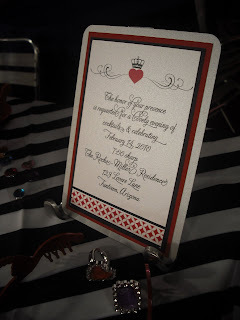 Setting the tone with your invitation:: I am a huge fan of handmade invitations verses the e-invites. 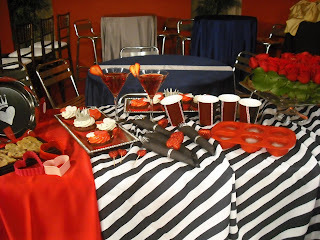 It sets the tone for your event and gets your guests excited about the festivities. Remember to include the who, what, when, where and how they can help and then add either an email address and or phone number to RSVP. Decorating :: Try making a centerpiece with floral foam and rose heads. Just cut into a heart, wrap with ribbon or greenery to hide the foam on the sides and place a rose head in the foam until the entire area is covered. Other ways to decorate are in your small pieces like cups, napkin holders, plates, linens, etc. It’s really all about the details and those details are what combined make a party so beautiful and lively. Food :: Don’t make things to complicated! Order some platters and stick some of your heart shaped horduerve sticks in them and wola you have your food and it’s apart of the décor. It ultimately depends on the time of the day but try for an after dinner party to keep your food costs low and people snacking. Other options might be cupcakes and heart shaped cookies. The Entrance : As guests walk in greet them with their very own tiara or crown. You could even go a step further and ask them to decorate and bring their own. Music : As your guests to also bring a cd or ipod mix of songs that all have the word love or queen in it. Ask them to be creative and original. If you wanted to take it a step further to make sure there were no duplicates you could give them decades to pick songs from! Sending them off with goodies :: Make them feel like you are adorning them with presents but in this case a swag valentines card bag. Give each guest a small pack of nostalgic valentines day cards, then line them up with their name on them and ask the guests to write little notes on their cards and drop them in their bags. Guests bags will be sealed and handed back to them as they leave. How fun it will be to rummage through all those sweet cards. If interested in learning more about our company visit our website or email Cicely Rocha.Miller cicely@lifedesignevents.com or call 480.219.8067. Many thanks to both Sara(h)'s on our team. Sara Garcia and Sarah Hubbell. Both of the Life Ladies came up with the majority of these ideas. We have such a creative team. Aren't you inspired? What are you doing for the red hot holiday?